Who is powering the Main Street economy? The report underscores what I have seen time and again in my work in diverse urban communities, and particularly in secondary urban markets. Close to home, this includes communities like Ossining, NY where Mexican and Ecuadorian immigrants have opened businesses, and Glen Cove, LI where Central American immigrants are more prominent. In both cases, these communities have seen an influx of immigrant business owners who have seized opportunities in the downtown area. The report has lots of interesting and little known facts about the importance of immigrants to traditional commercial districts. Immigrants make up 28% of Main Street business owners, while accounting for only 16% of the labor force and 18% of all business owners. In the Los Angeles area, immigrants make up fully 64% of all Main Street business owners. Immigrants are 10 to 15 percent more likely to be business owners than their U.S.-born counterparts. They make up 18% of all business owners, but take home 13% of business earnings. Immigrant workers are absorbed into the economy with only modest displacement of U.S.-born workers. Between 2000 and 2013, immigrants accounted for 48 percent of overall growth of business owners. Between 2000 and 2013, immigrant Main Street business owners increased by 90,000 and U.S.-born business owners declined by 30,000. Immigrants accounted for all of the growth in Main Street businesses in 31 of the country’s 50 largest metropolitan areas. Asians make up 49% of all immigrant Main Street businesses, ethnic whites make up 26% of immigrant Main Street businesses and and hispanic/latinos make up 20% of Main Street Businesses. 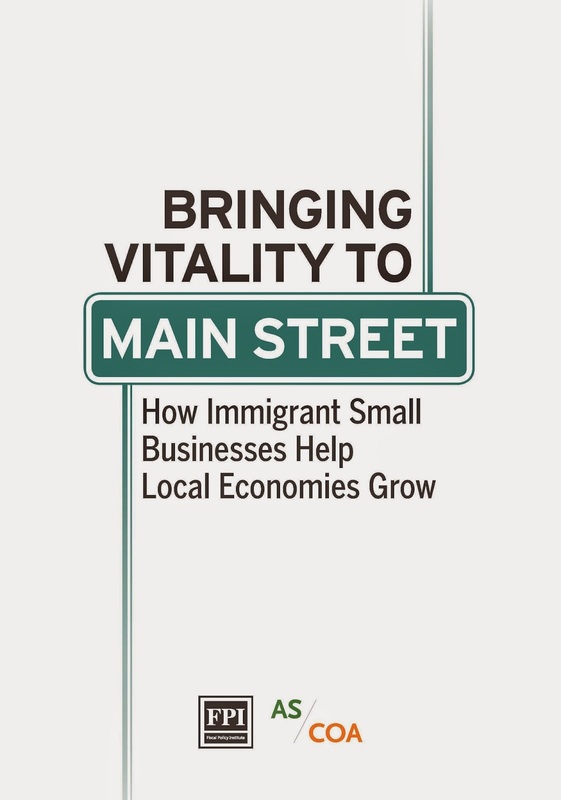 The top three immigrant groups that make up Main Street business owners include Koreans, Indians and Mexicans. This data serves as a policy clarion call to governments to actively help immigrants build their businesses, take advantage of incentives and initiatives, and improve the bureaucracies associated with business basics, like licensing and inspection. With that, I’m off to my favorite local spot to grab a taco…yum. The report defines “Main Street” businesses as those that fall in three board sectors: Retail, Accommodation and Food Services, and Neighborhood Services.